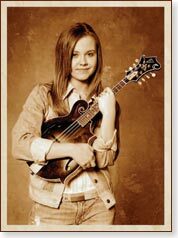 Kitty Hawk, N.C. — The Outer Banks Music Showcase is proud to present a Sierra Hull mandolin workshop on Friday, October 10, 2008 from 9:00 a.m. to noon, 3848 N. Croatan Highway in Kitty Hawk. Ron Block of Allison Kraus and Union Station will present bluegrass banjo and guitar workshops the same day, and will team with Sierra in concert at 7:30 p.m. Richie Dotson will host a "Playing Backup Bluegrass Banjo" workshop from 9:00 a.m. to 4:00 p.m. the following day, Saturday, October 11. For workshop attendees, registration is $45.00 for each workshop, with a $5 discount applied if registering for multiple workshops and for workshop participants attending the evening concert. For workshop registration and concert information, call (252) 261-7505. Sierra Hull has already emerged as a leading light in a new generation of bluegrass musicians. A seasoned performer, she has appeared on the Grand Ole Opry radio and television shows, and shared the stage with bluegrass legends such as Alison Krauss, IIIrd Tyme Out, Sam Bush, Mountain Heart and Ricky Skaggs. Secrets, her new solo release has received wide praise and showcase her considerable maturity as a seasoned mandolinist, vocalist and band leader. Click red map pin for driving directions to The Outer Banks Music Showcase, 3848 N. Croatan Highway, Kitty Hawk, North Carolina.